I thought it would be fun to honor our favorite fall toys (pumpkins and gourds) by dressing them up as turkeys for Thanksgiving! 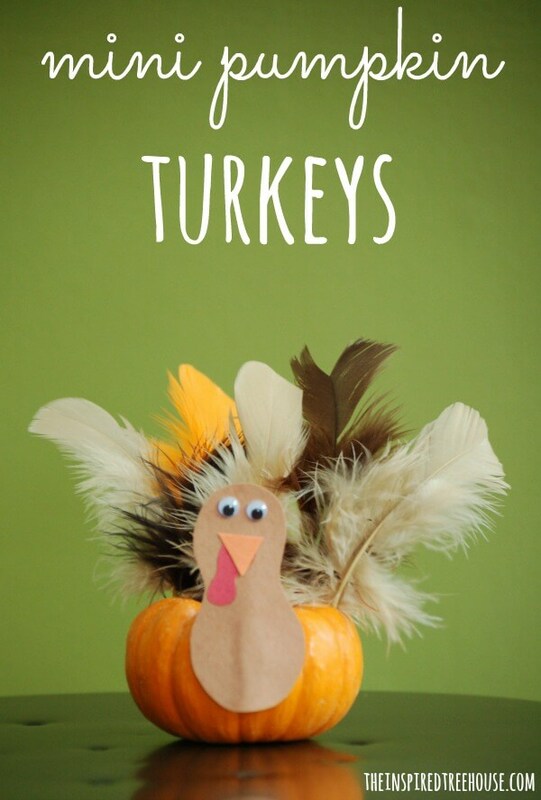 You’ll definitely want to add these to your list of fun Thanksgiving crafts for kids! We keep things pretty simple when it comes to holiday decorations at our house…mainly because of the two little boys running around and destroying everything :) Our favorite fall decoration? A durable wire basket filled with mini pumpkins and gourds on our dining room table. It’s pretty, but mainly it’s fun (and indestructible)! From the beginning of October all the way through Thanksgiving, one of our primary play activities is tossing, rolling, and kicking gourds all over the house (see what I mean?). 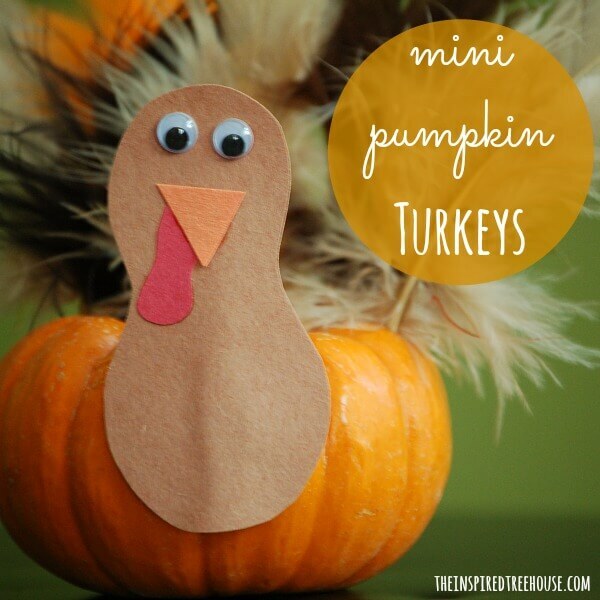 Here’s how to turn those mini pumpkins into a fun Thanksgiving craft for kids! Show kids how to use a skewer to poke a bunch of holes in the top of your mini pumpkin (keep holes on one half of the top of the pumpkin). Then, let the kids dress up their turkeys by pushing colored feathers into each hole, making the turkey’s tail feathers. Cut a small piece of brown construction paper into a peanut shape to make the turkey’s head/neck. Cut a small yellow triangle for the beak, and don’t forget the red wattle! Add your google eyes, tape the head onto the front of your pumpkin, and you’ve got a cute turkey for your Thanksgiving table! -Put other craft materials (stickers, craft gems, sequins, glitter, etc.) out on the table and encourage kids to get creative with their turkeys! 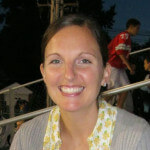 -Let kids draw their own faces on their turkeys. -Use the turkeys as name cards at each place setting of your Thanksgiving table by adding a toothpick with a little name tag to each one. Be sure to sign up to receive our newsletter, a weekly roundup of our favorite posts and ideas from around the web delivered right to your inbox! Simply enter your email address in the box in the sidebar and click “Subscribe”!